Please see the CarCynic FAQ for more information. The CarCynic is on Google Plus! Add the Carcynic to your circles so that you don't miss out on Motoring News, Safety Information, and Automotive Sarcasm. Not on Google Plus? You can still help the CarCynic. Link to carcynic.com on the social media site(s) you use! Have the CarCynic Appear at your Event! The Carcynic's Award-Winning Classic Citroen Automobiles are available for movies and commercials. Gives authenticity to European settings. The CarCyinc's garage is minutes from Central Florida Film Studios. Static or Moving. Terms Negotiable. The CarCynic has experience on film and TV commercial sets. Linuxslate.com was registered in 2000 to distribute, document, discuss, and support Open Source drivers and related software for Hand-Held Touchscreen Tablet Computers. Today, all Android Phones and Tablets are LinuxSlates, and Linuxslate.com continues to provide relevant software and hardware development, commentary, and reviews, with occasional commentary and reviews pertaining to other technology and gadgets. CarCynic.com is hosted on OnNow.net. OnNow is a Reliable and Professional Web Hosting Company that supports Open Source Projects, so CarCynic.com Supports OnNow. Check them out for your hosting needs. 09/03/2018: Did You Know?... The CarCynic is a DJ! 05/13/2018: Congratulations on that “New” Honda Clarity. It's design is 48 years old. 09/03/2016: CarCynic Sales: 1961 Mercedes 190SL "Barn Find"
06/07/2016: What's with the Citroën / Peugeot symbols in the Trump University logo? 09/19/2014: Does Citroën have a Future in the WRC? 06/07/2014: How did the CarCynic's Father know about the GM Ignition Switch Issue 45 Years Ago? 08/03/2013: Warning: Science Ahead: Why Don't We See Air-cooled Cars Anymore? 06/22/2013: Looking for the Aerial Footage of Citroen Rendezvous? 03/14/2013: Holy Citroën! It's the Popemobile! 02/21/2013: Today (Feb 22) is Robert Opron's birthday. 02/07/2013: The Peugeot Citroën Air-Powered Hybrid: Why is this Different Than "Miracle Cars" of the Past? 01/11/2013: Help for Linda, Who Smells like the Radiator Fluid in Non-existant Cars. 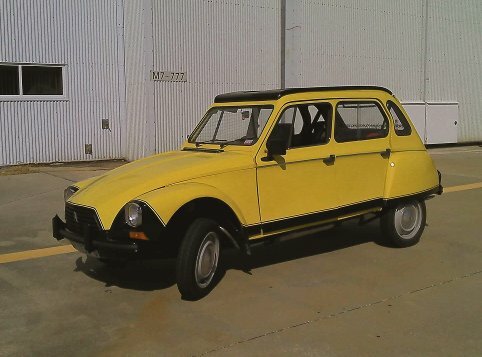 01/11/2013: Reader's Search: "why are 2CV good off road [sic]"
08/01/2012: This Post has Nothing to do with Cars. Well - OK - It Does have Something to do with Cars. 06/07/2012: Another Modern Citroen in the USA -- Liam Doran - Global Rally Cross Championship Citroen C4 -- UPDATE: Sebastian Loeb also to Attend! 05/31/2012: Is the Citroën 2CV Safe to Drive? 04/25/2012: Citroën Sponsors "Electric Odyssey" - a Citroën C0 Travels Across -- The USA?! 03/26/2012: Did you know that US Air Bags are more Dangerous than European ones? 03/22/2012: Carcynic is brand-new, but are we being copied already? !